Aiming to establish the Performancing Ads brand with the Filipino WordPress blogging community, Splashpress Media has recently signed up as a sponsor for the upcoming WordCamp Philippines. Organized by the Mindanao Bloggers community, the event aims to bring together WordPress users from all over the country, and also to encourage developers to use WordPress not only as a blogging engine, but also possibly as a content management system for websites. While there have been previous blogging summits, events and blogger meetups in the country, this will be the first WordCamp ever in the Philippines. Splashpress Media‘s very own WordPress Philippines community website is also collaborating on the event. Meanwhile, sticking true to its motto of helping bloggers succeed, Performancing has launched the Performancing Ads service to bring together advertisers and publishers in a meaningful marketplace where advertisers can find relevant blogs to sponsor. Performancing Ads is also letting bloggers get the most out of the system by employing an affiliate program, through which users can earn from referrals and ad placements on referrals. 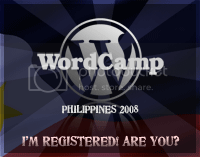 WordCamp Philippines will be held in two places and dates–September 4th in Davao, and September 6th in Manila. Splashpress Media will be giving a PowerPoint presentation about its newest project, Performancing Ads, as well as distributing other relevant marketing material (CDs, brochures, etc) to all attendees.